This weekend I found this super cute mini hat hair piece, a la Alice in Wonderland. Normally I would invite Charlotte into my crafting projects, but I wanted to do the first one on my own so I could see if this was a “child friendly” craft. I do believe you could do this with your child, but there is a glue gun safety issue. If you get felt hats, you can probably use Elmers Glue and large child friendly rhinestones, felt pieces, and ribbons to make it safer. It’s a cheap enough project that it shouldn’t matter if it stays together long term. 1) Gather supplies. Honestly this just depends on what you want to put on it. I already had tulle, fabric, and a variety of ribbons in my house. 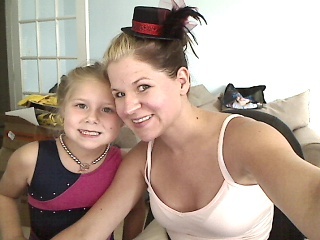 I purchased the mini hats for $1.99 (a fraction smaller than the one I am wearing) a piece. I also bought a few marabou poofs, some feathers, and some very specific ribbon. I spent just over $15 and got all the items for 3 hat designs. You can get 40% off coupons right on Hobby Lobby for your area. You will need a glue gun and alligator clips too. 2) I chose to gather some material around my brim. Once I had the material placed, I added some feathers and decided that I needed another pink ribbon to offset. I took it apart and started again. I don’t believe there are really any rules when it comes to crafting. Just do what you enjoy. Don’t be afraid to make a mistake, you can always start over. 3. I added alligator clips with hot glue and then used a small felt circle to secure them on. They have alligator clips with ‘teeth’ on them, but Charlotte complains those tear at her hair. She is the boss. 4. I personally felt it needed some tulle (everything needs tulle) so I folded some in half, secured with hot glue at the base and put on the hat. I then trimmed the tulle up to be “poofy”. I also added a little finishing ribbon to the back to cover all the spots where I glued to give it a more “polished” look. Other ideas are to put a rhinestone, hanging korker ribbons, or a ruffle there. 6. All it needs now is a head to clip on. I cant wait for Charlotte to get up in the morning! I am off to make another one. If you love crafting,y ou can also check out my Mardi Gras Mask inspiration or my how to make a tutu tutorial! « My husband told me I look thinner! I was wondering where you can buy the hats? that is a really quick and easy project, love it! Never thought to look for premade hats, what you did with the ones you demo’ed are simply divine! thank you for sharing with us. Thanks for posting this! I was looking for a way to secure a mini hat to the hair…I happen to have those alligator clips in my “hair stuff” drawer and of course I have hot glue gun stuff, so now I’m set! Putting the extra circle of fabric over to secure it is a great idea. Thanks again. I love this! I’ve been wanting to make one myself. What section of Hobby Lobby did you find the mini hats in? Way Cute! I can’t wait to try this out!!! Love it! Love it! My next tea party will include make your own tiny hat now! Love it! Seems easy as well. Adorable Trisha. And so right most of the time you can make items for much less than you buy them. Hooray for crafts! LOVE this idea!!! OMG! How adorable! Plus really easy to make! This is an amazing idea, Trisha! I love it! =] I can’t wait to do stuff like this for Hayden.. right now she just destroys everything, so it’s best I wait.